Palm reading short fingers. What short fingers reveal. You short-fingered people don't need or want as much information from the outer world as do long-fingered people. Short-fingered people operate more on their intuition rather than seeking data and information from others. You short-fingered people are more inner-directed than people with long fingers, and you don't need or look for advice from others. You do just fine using your own personal resources. Short-fingered people are action oriented and don't need or want lengthy explanations from other people -- especially from long-fingered people! The challenge for short-fingered people is not to jump to conclusions and take action without studying the situation first. If you have short fingers, it will be wise for you to guard against being too impulsive. Remember this: Good planning prevents many mistakes. People who normally hold and display their hands relaxed with open fingers that are not rigid, feel safe and secure in the present setting. They are free spirited people with a "live and let live" attitude. They are not ruled by conventional rules of others. They don't like to listen to the opinions of others, and they feel free to chart their own course in life based on their own unique views. When the fingers are held tightly together, with the palm open and flat, it is a sign that the person feels unsafe and not receptive to new ideas. The fingers need to be "closed" in order for the person to feel safe and secure. If the fingers are stiff, it shows this person to be very resistive to any changes to present state of mind. Stiff short fingers tell the world, "Don't bother me! I don't need your help!" If you have exceptionally short fingers, you are action oriented, and you don't spend a lot of time thinking and talking about what you are going to do before you take action. 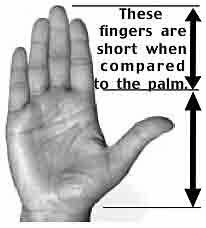 If you have really short fingers, you might consider choosing friends and a mate with fingers short and straight like yours. Your short-fingered friends and mate will understand you much better than long-fingered people. Short-fingered people have similar likes for peace and quiet areas where they can putter around doing whatever pleases them at the moment. Caution: Since short-fingered people don't like thinking about and discussing their plans and actions, they often take action without sufficient research and planning. They are often impulsive and may make mistakes from lack of accurate and timely information.